The Nicest RV Park in Del Rio ! Located less than a mile from beautiful Lake Amistad! 1/2 mile from the #1 Bass Fishing Lake in the World! Tours to Mexico, Sonora, Lucky Eagle Casino, and other points of interest! 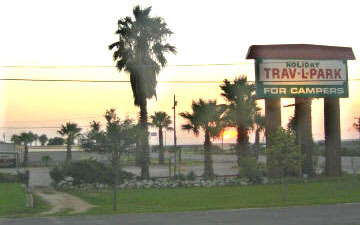 Holiday Trav-L-Park is owned and operated by RVers and is the largest and only four star travel park in the Del Rio area. We have traveled the US in all types of vehicles over the years and understand the needs of the modern day traveler and camper. Our facilities are dedicated to make your stay easy, relaxing and comfortable while at the same time offering you plenty of things to do. Mexico is only about ten miles away with an easy access to restaurants, clubs, gifts, and other tourist attractions. This is a good source for low cost prescriptions, liquor cigarettes and dental work. The abundance of bass has made Lake Amistad the home for many excellent fishing tournaments. A good boat launch, and marina for other needs for the avid fisherman are only minutes away.